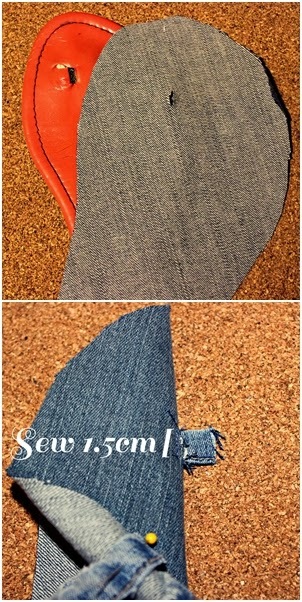 First cut your pant hems into 4 pairs of straps. This is where it gets tricky. 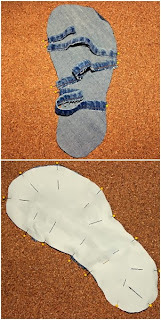 The measurements I came up with are those that fit my feet (I'm a US size 7 by the way), so obviously I think it'll be best to do some measuring of your own feet or use similar sandals you already own to find the most correct fit for the straps. That's why I recommend they be stretch denim, for that reason and also comfort. Cut the following straps: One pair at 3.5", these will be your toe rings. One pair at 5.5", one pair at 6" and the last pair at 8". Set those aside. 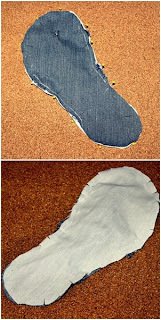 Then you'll want to take a flip flop to use as the pattern mold. Set it on your denim material. Use your pencil or chalk to mark around the shoe adding about half an inch. Do both shoes and cut them out. I didn't like the wash of the denim I had available so I used the wrong side for the right side. At this time cut copies of the denim onto your scrap piece of cotton. Now you should have four feet, two denim, two cotton. The cotton will be the underside lining to avoid visible seams and keep all straps intact. It's also easier to glue on this way, least for me. 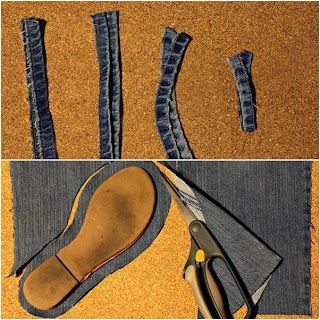 Take the denim pieces and cut a small slit big enough for the toe ring straps. 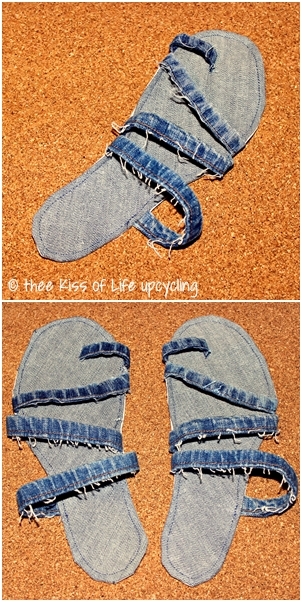 To position the slit I referenced my old flip flops. Next take the toe ring strap and pass it through the slit until there's half inch of the strap out of there. You will sew the strap in place for 1.5 centimeters long, very close to the raw edges of the slit. Now pin the rest of your straps into place. It helps to use your foot and actually place the straps on them but of course be careful with pinning. Once you have them where you want them, sew them down at less then a quarter of an inch and remove those pins when finished. Then place the cotton shoe over this denim side with the straps and pin that together. You will sew all around at 4/8" and leave a small opening to flip the fabric inside out to reveal the insides as your outer shells. Before flipping cut vertical slits around the shoes to allow nice curves once flipped. With the shoes now flipped, try them on your feet and check out how the straps feel. I had to un-sew and re-sew some of mine to get a more snug fit. You can either iron press them now or after you do a final seam all around the shoes at about 3/8" making sure to close the openings you left for flipping. I wasn't able to sew completely around as some straps were in the way, as they should be but still, it's okay to only sew around what's visible (no one can really see under the straps anyway). Once you've got a good fit and it's all sewed and pressed, you're ready to glue them down onto your old pair and muah! You've given new life to an old pair of shoes that were heading to the trash. P.S. I took some bleach to the straps to tone down the dark denim a bit. I forgot to include a side view of the sandals but I can tell you that since I chose to use the bright orange flip flops I had, there is a thin visible layer of orange. That's okay with me though. Could you put memory foam in them as well? Great idea! Those are really sweet sandals you ended up with. Thank you for the tutorial! You're welcome and thank you for reading! At the point when the mid year sun is straightforwardly overhead, Sandals for Girls standout amongst the most ideal approaches to beat the warmth is to wear the exemplary summer shoe: the shoe! Out of all the online shoe shops present in the web,havaianas luna there is one which has accomplished believability over the numerous years and is currently considered as the most extraordinary online shop for shoes.